It is a Work Health and Safety Act requirement that PCBUs (persons conducting a business or undertaking) manage electrical risks at their places of employment. This includes ensuring that all the equipment used on their work premises is electrically safe and is not exposing workers and volunteers to undue risk. This means that churches deemed to be workplaces need to have their electrical equipment regularly inspected and tagged in order to comply with this requirement, even if it only consists of lower-risk plug-in machinery such as computers, heaters and a photocopier. Signs of wear and damage and indication of defects. Discolouration from overheating or exposure to moisture. Safe use of electrical cords. Proper use of guards and covers if required. That the correct plugs are used for the appliance. For low-risk equipment, testing and tagging should be done at least every 12 months. It should also be carried out after an appliance has been serviced, and before first use of any second-hand equipment. Brand new equipment does not need to be tested but should be visually inspected before use for any signs of damage in transit. Higher risk equipment (such as that used in manufacturing or commercial cleaning) will require more frequent testing. Electrical testing should be carried out by a licenced electrician, electrical inspector or person who has completed a structured training course and deemed to be competent. The person conducting the test should have a full understanding of AS/NZS 3760 and the relevant legal requirements. Tagging should include the name of the tester, date and outcome of the test, and the scheduled date for the next test. To manage electrical risk it’s important to make sure your electrical practices are safe. This means avoiding the long-term use of extension cords and double adaptors, and ensuring that damaged cords or electrical outlets are not used. Our article on electrical safety has more information on these issues. 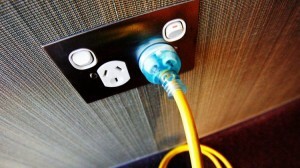 For more details on managing electrical risks in the workplace, go to SafeWork Australia here. All very good points Tess, thanks for pointing this out!